Lucas Van Oostrum is co-founder of Delft Aerial Robotics as well as Aerialtronics. The Flying Dutchman joins Ian and tells entrepreneurial tales of starting up a high-end drone manufacturing company in Holland in 2011 and how we’ll eventually move towards full drone automation in the near future. [00:00:00] [Introduction] Welcome to Commercial Drones.FM, the podcast that explores the commercial drone industry, the people who power it, and the concepts that drive it. I’m your host Ian Smith. 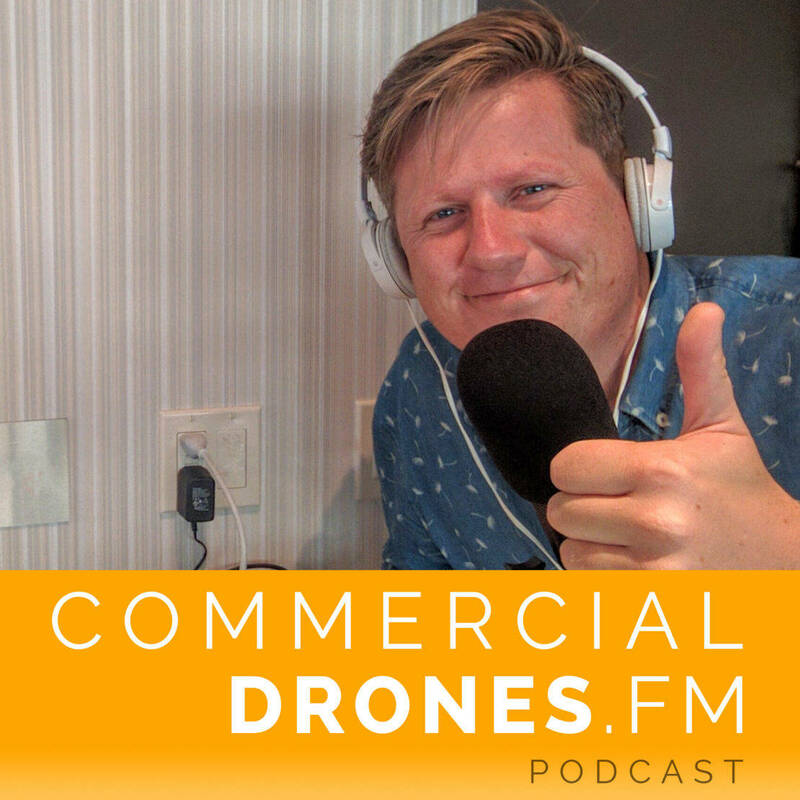 [00:00:15] IAN SMITH: Hey everybody welcome to Commercial Drones.FM. I am sitting here in San Francisco with the co-founder and director of Business Development at Delft Aerial robotics. Four years ago he co-founded Aerialtronics and at Delft Aerial robotics, he’s created an ecosystem for researchers, startups and industry professionals that’s fully committed to solve the automated drone workflow challenge. His name is Lucas van Oostrum. He’s currently based in Amsterdam. So thank you so much for coming to join the show in San Francisco today Lucas. [00:00:53] LUCAS VAN OOSTRUM: Oh you’re welcome, you’re welcome. Always nice to be in San Francisco. [00:00:57] IAN: Excellent. So speaking of which, so you’re based in the Netherlands. You’re based in Amsterdam to be specific, is San Francisco the heart of the drone industry? [00:01:07] LUCAS: I would say there’s a lot of drone activity going on in San Francisco. Yes there are a lot of companies here. But don’t underestimate the French, although a lot of the French companies actually move here once they become a little bit successful. [00:01:21] IAN: That’s very true. Redbird, Delair-Tech. [00:01:23] LUCAS: Yeah yeah. That’s happening. But no, there’s a lot of activity here. So for me San Francisco is my second home. I’m here a lot almost every month because there’s so much going on here. [00:01:39] IAN: We just saw each other just last month actually. You were town for the Drones Data X Conference. [00:01:45] LUCAS: Yeah which was a lot of fun. [00:01:47] IAN: That’s right. Absolutely. I think you guys went to that extra weekend at the end too. [00:01:51] LUCAS: Yeah, did some surfing. [00:01:52] IAN: That’s a very unique way of doing a conference, but pretty cool. So speaking of the Netherlands and this is obviously a commercial drone show. What are the commercial drone regulations like in the Netherlands? [00:02:06] LUCAS: OK so first of all, maybe you should tell your listeners where Netherlands is. Most people think it’s in the Nordics. You know it’s maybe in Europe, so most people called Holland, because that that resonates a little bit more but, Amsterdam. You know some people think Amsterdam is a country. Well Amsterdam is actually the capital of the Netherlands. So if we’ve got that out the way. [00:02:28] IAN: They have got good cheese in Amsterdam, and that’s a good country. [00:02:29] LUCAS: Yes the Netherlands is a very small country. Like very small, because it’s so small, back in the day they used to. Well that was one of her hobbies to conquer a lot of other countries. So we had a lot of colonies. What that says about the Netherlands is that they were traders, traders by heart. [00:02:51] IAN: Very seafaring people. [00:02:51] LUCAS: Yeah, because they’re a small country, they’re always looking outward and they have this really strange language called Dutch. No one speaks it, maybe South Africans. But nobody speaks Dutch, right. So that’s why a lot of people speak English in the Netherlands. If you go to the bakery or to grocery shop people speak English. We are used to trade. If you look at the drones regulations in the Netherlands, they’re very very tough. [00:03:23] IAN: Tough as in, like it’s really hard. [00:03:26] LUCAS: Very restricted, it’s very restricted. We might be traders but we’re also very risk averse when it comes to funding and also to regulations, we’re very risk averse. And so what you see is that when we started Aerialtronics, my previous company. So first we were these Cowboys. We started in 2011 when we were first these cowboys, we just did everything that we liked. Right. [00:03:57] LUCAS: We were building a product. So we wanted to test it and we flew it off a roof. We had a little roof at our office. We just fly, you know we just did it. [00:04:05] IAN: Was it one of those offices, was in Amsterdam? [00:04:14] LUCAS: So it was a harbor town, a coastal town and we flew it off the roof. We did all our interviews and everything there. People want to see it. It was really fun. [00:04:25] IAN: What year was this? [00:04:26] LUCAS: 2011. When we started. Obviously we became a more serious company so we had to abide by the rules, abide by most of the rules. By doing that, for us it was very interesting to actually start exporting straight away. [00:04:51] IAN: So exporting. So Arieltronic made drone hardware. [00:04:54] LUCAS: We made drones, very nice monocoque frame, carbon fiber drones for commercial purposes. We exported a lot, 96% of our drones were not sold in the Netherlands. Apart from us the being small country with the restrictions, it was very difficult to you know run our business and use them. [00:05:22] That’s also why we went to the states alone and we looked at you places where we had a good market, where we could sell. [00:05:31] IAN: Was the U.S. leading the import of those Aerialtronics platforms at the time? [00:05:35] LUCAS: No no, I think UK was very interesting, because they had some rules and regulations in place very early on. The UK was a very good country for us. It was spread out through anywhere, you Australia. We sold to the Australian police which was all the way to the other side of the globe. [00:05:57] But you start to see what are the applications, is it security? is it’s construction? Our vision from the start, we were interested building the application on top of the hardware. First you need hardware. So one of the first investor, Dutch investor, very big name in the Netherlands. The first thing he said, you know what you make hardware. It’s so simple to copy, right. What’s your thing? Yeah ok well first we need the hardware and then we can build the software. [00:06:41] He said you’re never going to make it because it’s just going to be commodity. Well if you now look five years later. How many companies build a proper drone? Ask yourself that question. How many manufacturers of actually good quality drones? I could only name DJI is probably on top of that list, maybe Yuneek is coming coming along, then you have Parrot. Parrot makes an awesome, eBee, well actually senseFly makes and also eBee. But if you look at the eBee, they’ve been saying that they,ve come out with a simple multirotor which takes a very long time before the eXom comes on. [00:07:26] IAN: It’s not called the eXom anymore. They had to change the name to, I don’t know what it’s called anymore. [00:07:30] LUCAS: Well it’s called something different. Parrot is a big company, but even creating such a simple thing as everyone thinks as multirotor is difficult. Why? Because you need quality control. Why? Because if you build a little car or you build some other electronics like a radio or something. If it stops, if it breaks down, it just stands there. If a drone stops, it falls out of the sky. You really need good quality control and really good quality stuff. [00:08:07] What we found out at Aeriatronics, we had so many crashes, so many things. We learned a lot from it. Your ESC, your wiring, interference and everything. You have to think of so many things and then find the right parts and if the right parts are not there. You build them yourself or manufacture them your self. It’s very difficult, so the barrier to enter is going through hardware, it is very difficult. Look at 3D Robotics for example with the Solo. It’s not a big success, because it’s hard and still is hard to do proper manufacturing. [00:08:43] IAN: Hardware is hard. The Solo’s on the Amazon Prime Day, today’s Amazon Prime Day, if anyone is interested. It’s like heavily discounted like 40 % off. I think they they just announced a thermal sensor today but they didn’t name who. I’m imagining it’s not FLIR, because FLIR has that DJI partnership. [00:09:00] LUCAS: FLIR can partner with anyone right. [00:09:03] IAN: That’s true. If I was DJI, I would definitely have tried to ink in some exclusivity. [00:09:08] LUCAS: Maybe for the short term. Building hardware is difficult. So everyone has been in that difficult position, so what are we going to do, right? For example the company you work for as well DroneDeploy. They were selling hardware at first as well. You know part of the hardware. There are so many companies that did that. Skycatch for example they had a whole solution. [00:09:40] IAN: They’re still going with. [00:09:41] LUCAS: Yes, but it’s difficult to do that. First need hardware to build your software stack on top. For us was that was a steep learning curve. [00:10:01] IAN: What was your path into the Drone industry. We kind of jumped right into it. So how did you even start? How did you get into Aerialtronics? What was the lightbulb moment that went off over your head? [00:10:13] LUCAS: I’ve always been very interested in computers how they tik, how they work, more like a computer hacker. I like to break into systems and see how they worked. Ethical hacker obviously. [00:10:30] LUCAS: For one of the events that we organized, like golf tournaments. I was doing all kinds of technology for golf tournaments. There was this guy, I was introduced to him by a friend of ours and he said yeah you need to get some aerial shots man. I said I can’t afford a helicopter, he said no he’s doing it with a drone. They called a little radiographic helicopter, drone was not used. It was in 2009 or 2010, I was really blown away by it. [00:11:11] IAN: This was in the Netherlands. In Holland. [00:11:14] LUCAS: I was in the Netherlands. [00:11:15] IAN: Wait, hold on. Netherland’s big enough to have golf courses or is the whole country of “Amsterdam” have only one golf course. [00:11:25] LUCAS: We have gone off course, yeah. For the European Tour we have one golf course. Anyways, when I saw that thing, I really loved it. Back then, it was a microcomputer, so there’s a thing that you have to solder together, you have to do a little bit of work to get it together. It flew for eight minutes and it was one of the hardest things to actually control. But with this guy my partner in Aerialtronics, he was so good. He was a good pilot. He could keep that thing in the air. [00:12:04] IAN: This was before it had GPS stability control? [00:12:07] LUCAS: It had a GPS, but don’t expect too much from it, because it always flew away. This guy almost flew almost everything by hand but it was always scary to fly. When we started we did a lot of production work as well. We were always so nervous. One time we for a golf tournament they thought it would be nice to do a kickoff on the highest building in Holland. Which is like a 300 foot building. The highest skyscraper in Holland, well if you can call it a skyscraper. [00:12:57] Anyways, we were on a rooftop and there were these antennas. These directional antennas for telecommunications. We were taking off and he was flying, coming too close to the antennas and this was with the old technology. With all the open hardware, like this old PCB. [00:13:16] IAN: Yeah, flying PCB board. [00:13:18] LUCAS: Flying PCB boards. I saw it happen, it started wiggling and then it went over the side of the roof in the middle of Rotterdam. If it was to crash it would have crashed into people and everything, but he was great. He managed to recover and then land this thing. Nobody noticed what happened, but we were so afraid. Then he said, I’m never going to fly again. [00:13:45] IAN: It’s just so much. For example today I was at theif the Intersolar Conference here in San Francisco and you just look at a Phantom 4 for for example, just an example. DJI has a little cage that they fly around their drones in at conferences. There’s definitely not GPS inside. They just have that optical flow and those little sonar sensors and that thing locks on to a point on the ground and just like hovers there like a rock. So technology’s come quite a long way in the past couple of years. [00:14:12] LUCAS: That’s so cool. When I first got into contact with DJI was at the NAB Conference was in the Spring of 2012. We were at NAB, a broadcast conference in Las Vegas. [00:14:32] IAN: What does NAB stand for? [00:14:34] LUCAS: It’s a broadcast conference, so there are two big broadcast conferences in the world where all the studios. [00:14:44] IAN: National Association of Broadcasters conference. [00:14:46] LUCAS: Everyone, every studio, every TV station. They come there to get their gear. So big halls full of cameras, of equipment, of everything. Then you have your own drone area. Back then only Sony was exhibiting with our drone, we branded it Sony for all their customers and we flew it out in the desert with them, with their customers. You had this little booth by DJI and there was a guy who made gimbals as well, Photohire from New Zealand an he was actually pretty good at that as well. The cool thing was Frank, one of the top guys at DJI. He was the flying the…. [00:15:46] IAN: Oh, the Flame Wheel. [00:15:48] LUCAS: Yeah, he was flying that in the exhibition hall over people and he was just doing it. [00:15:55] IAN: This was before they realized what they could do. [00:15:56] LUCAS: They were already selling all these kits and it was before the Phantom came out. He was just flying it indoors and nobody knew about risks or anything. The year after they we’re flying outdoors and after that cages and everything. But it’s 2012 and 2013 you really saw the rise of DJI. [00:16:21] IAN: You take the to the conference, don’t need any permission, just take it off and then you’re good to go. [00:16:25] LUCAS: Yeah exactly. They were flying it indoors and everything, but it has come a long way in those areas. [00:16:33] LUCAS: Technology has so much improved but still so many opportunities. [00:16:39] IAN: Speaking of that, so Delft Aerial Robotics, we mentioned that that’s currently what you’re doing right now. What is Delft Aerial Robotics for someone who has no idea what it is? [00:16:51] LUCAS: So Delft has technical university. [00:16:57] IAN: Delft is city. [00:16:58] LUCAS: It’s just it’s a city in the Netherlands. It’s a university specialized in technology. Yo can do all your engineering courses there. So in the drone space, it has already what’s called their ‘micro air vehicle lab.’ For the last 10 years, they’ve been working on drone technology. On hybrid systems, hey have the record for the smallest and lightest camera drone in the world, it’s 3 grams. I don’t know how to translate that into a different system, it’s very, very light. [00:17:36] IAN: It’s like a wasp. [00:17:39] LUCAS: Yaah, like a wasp, it’s called the DelFly micro. I studied at Delft. I never finished my education, but I spent quite a number of days there. They found out that they had 200 robotic researchers at Delft, which after MIT their second in the world when it comes to robotic research. They do a lot of robotic research there. So they combined that and we created something called Robo Valley. Well obviously you know resembles Silicon Valley. We tried to get industry companies, research and government together to create this ecosystem where robotics and companies and research could be accelerated by bringing all those entities together. [00:18:41] Also creating spaces where companies could, you know start a company, interact with the labs. At the campus you know have 3 buildings which are occupied by these robotic companies, by the researchers and they all work together to actually accelerate robotic research. One of the things that happened recently was we started a 100 million euro fund which translates into, what? 1 point, eh – . [00:19:18] LUCAS: No 110, 120. [00:19:19] LUCAS: Yeah the exchange is pretty good. Anyways, so that was actually started to also fund that ecosystem. To make sure at the startups have access to money because one of the things that is really different from your Bay Area and Europe is you have much better access to money. Obviously you still have to do a pitch but in Europe people are very risk averse when it comes to funding. You can get some seed funding, but then after seed funding you’re on your own, until you are making a profit, then there’s enough ample money again. [00:20:07] We wanted to cover that and the way we did it is by starting a fund and getting a Canadian fund company in to actually managed the fund. What we did was to create this ecosystem and within this ecosystem, make sure that everyone is connected. So you can accelerate. [00:20:32] IAN: What’s the goal, the end goal? [00:20:33] LUCAS: The end goal is there if you want to do something in robotics in the world, go there. [00:20:42] IAN: So not just drones. [00:20:43] LUCAS: No, to give you an example. Delft ended second in the Hyperloop competition for SpaceX. MIT won. Okay, I don’t know if I can say this, because they’re American. Yeah, but still the Dutch are still working on the Hyperloop project, because they had a very good idea. One of our companies in our ecoysytem just won Amazon’s picking challenge this year. [00:21:17] LUCAS: You know that Amazon has huge warehouses right? But their warehouses are just driving shelves, so these shelves are driving through the warehouse and then someone human, picks out the product and puts it in a cart. [00:21:35] IAN: So a robot does instead. [00:21:36] LUCAS: Yeah, but because you have so many different products soft and hard, you cannot squeeze the product. So picking it is already a challenge, recognizing the product product and then putting it in the right bin is very difficult. Those are just a couple of examples. We are very good in haptics. I don’t know if you know haptic, but if you’re controlling something at one place and you want to be able to steer a robot arm at the other end and mimic exactly what you’re doing. [00:22:16] IAN: With the same amount of force or something. [00:22:16] LUCAS: Yeah and they made it actually more difficult. They did the movement on the ground and then it was mimicked in the international space station. So they formed a task and you had delays. [00:22:32] IAN: Is it the ROBOnaut on the space station? [00:22:34] LUCAS: I don’t know what the name is of the arm they used. [00:22:38] IAN: My dad actually might have had a part in that, he works at NASA works on the ROBOnaut which is up on the space station. Robotics background. [00:22:49] LUCAS: I just wanted to give some examples of how broad this is. With a lot of this technology you see common things like the need for sensors. You have them in drones and you have them and ground robots. So development of sensors is very important. Then you have AI like artificial intelligence, machine learning, you see that in a lot of things. If it’s visual data or it’s different data. So Machine learning is a hot topic and big data. Those are topics that you see all over the place when it comes to robotics. [00:23:33] This is the ecosystem and because my passion is with drones, we started a company called Delf Arerial Robotics. My two partners and I, Ari and Bart. Bart had been running the micro aerial vehicle lab for last 10 years. The university is also a shareholder in our company. That way we can leverage IP from the university which is nice, so we have access to all those robotic researchers. Our goal is to rollout a fully autonomous drone network. [00:24:12] IAN: That’s what I was waiting for as this is something that really inspired me when we last met. You were telling me about your plans to just fully automating the drone workflow and taking the human out of the loop. I’ve been kind of latching onto that as my idea of the future and it just makes a hell of a lot of sense in making these drones truly, you know the quote unquote drones that kind of think for themselves. Why haven’t we automated that workflow yet? Why are we not there yet? How come this is not the reality that we live in today? [00:24:42] LUCAS: I started by saying that manufacturing a drone itself is already very complicated. I always look at the four steps that you have to take to get to full automation. You have to make the drone fly and navigate autonomous, which is the first step. It needs to recognize objects, it needs to be aware of its surroundings, it needs to be able to fly itself, know when its battery runs low and it has to fly to it’s little nest to recharge. [00:25:14] The flying itself is the first. We are making great progress and that progress is not coming just from Delf. It’s coming from companies like Parrot, DJI, Yuneec. They’ve been working on that. But also Intel with their RealSense. There are a lot of work being done there which is very interesting, but thats the first step. [00:25:44] The second step is in the sensing itself. So using sensors, using cameras, using sniffers, to actually see something and to capture information. Some of the sensors like the hyper-spectral sensor are stille in development, still very expensive. If you really want to say something about your surroundings, theres a lot of work to be done on the sensors and you want the drones to automatically capture that information. [00:26:16] Capturing that information can be a challenge by itself because you want the drone to see if the lighting conditions are good. There’s already in the capturing of the data where we are saying, hey do we have enough overlap when we do a mapping? You want to do that in a drone because otherwise, you don’t have a human that when you get the data says that data is good or not good so we do have to do another flight. There some intelligent technology that needs to be in there. [00:26:51] The third thing thats also important, is when you get the data you want to be able to process the data. Data is data, you want to turn it into information. Coming back to your company, DroneDeploy, that’s what you guys do as well. You turn large chunks of imagery, you turn it into sensible information for the end user, which is the farmer. On top of turning it into information, an NDVI map. That’s one of the oldest things around -NDVI. [00:27:29] IAN: Yeah, late 70s. [00:27:29] LUCAS: NDVI itself doesn’t say that much, So you need an agronomist most of the times to make sense of that information and turn it into actual information that the farmer can act upon. That’s step three combined. Creating information. [00:27:50] For us the fourth step is once you have the information, you have to act upon that information. You want to be able to share that information like, Internet of Things and of everything, with other machines. If we take the farm example, you want to have the irrigation system be able to act upon it or the fertilizer machine. The fertilizer robot, because if you look in agriculture. A lot of the systems are completely GPS guided. If a farmer sits on the machine, he’s reading his newspaper because he needs to be on it, but the machine is actually doing the work. [00:28:33] IAN: Tons of smart tech in that. [00:28:36] LUCAS: Yeah, so the flying, the collecting, the processing and then the sharing of information and acting on it. That’s what we see. We want to roll out this fully autonomous drone network and that’s on the horizon. It will take some time to get to that stage. What we do is we invest in companies that solve part of the solution and we make partnerships with companies that already supply tech, because in the end we want to be a network operator. [00:29:10] IAN: Do those companies have to be Dutch or can they be anywhere? [00:29:13] LUCAS: They can be anywhere. That’s the whole thing. We don’t look at boundaries. I don’t want to create everything myself. There’s so many companies that try to stick to that and want to do everything themselves. You need people that specialize in certain types of technology or in software. That’s why we invest in separate companies and we don’t try to create everything on our own brand. We want to really focus on rolling out that network, making sure that legislation allows us to do it, making sure that we have the right to do it. [00:29:54] IAN: Legislation, this was my next question. Are we held back more right now by technology or legislation/regulation on making this a reality. This fully autonomous drone network. [00:30:09] LUCAS: I think it’s a bit of both. Although a lot of companies probably would claim that they have a perfect solution already to do it fully autonomous. We’re not even at the Tesla phase, if you look at Tesla at their autopilot. I think we’re a little bit before that but everything is going pretty rapidly. [00:30:37] IAN: How long do you think it’ll take then until we’re fully automated? [00:30:44] LUCAS: I would say that it takes another three years, which is a long time. [00:30:52] IAN: So your career is definitely not even close to being over. Is there a point that you sit back at some point in the future. You take a seat, exhale very deeply. We’re fully automated, we’re doing it. That you’re totally satisfied and that you have no more work to do or is there always going to be? [00:31:13] LUCAS: That’s the 10 years of iPhone moments. Now you have 10 years of iPhone, they will come out with a new phone but nobody cares anymore, because it already works. A better camera? whatever, better resolution – whatever. You don’t need that. So we have to go through that whole phase. We’re almost at the iPhone stage, where you have a good iPhone, then we can improve it a couple of years, more apps come through it. Once we have a 10 year old iPhone, then yeah. [00:31:51] IAN: So for you. Looking back at your career and your the drone industry which is spanned back to 2011. Has there been a key moment so far that sticks out at you in drone technology in the drone industry? Something that you you really noticed and you noted in your mind and you thought. Wow, we’ve made so much progress. Like was there was a point you felt that way? [00:32:17] LUCAS: I can talk about myself, I can name a lot of points but I would say that the DJI Phantom is the biggest thing that happened in the last couple of years because what they did was really unique. When everyone was just building drones, gluing everything together. We were making a very nice thing. However building it at that price, producing it in like mass quantities, same quality for everyone, GPS, really easy interface to control the drone itself. That was a huge thing. [00:33:05] The Phantom really changed a lot of the things that were happening in the industry and everything that happened afterwards obviously with their IPO. A lot of things happened but I think that was a masterful move by DJI. The Phantom is really what made that company big and made the technology accessible by anyone. I think that was one of the major things that happen. [00:33:38] Another major thing that happened is on legislation side. Here in the U.S. that there’s finally a rule, that is a very key moment. I would say that it already started when they started with the 333 exemptions. I think it was two years ago in 2014 in December, there were 33 exemptions or 22. [00:34:14] IAN: That’s awesome. Its a big thing. Last question or last thought actually, not really a question. I’m going to kind of leave it open. You founded your fair share of companies. I checked out your LinkedIn, co-founder of Aerieltronics a drone company. You’re in robotics still, you’re already still founding companies. What is one piece of advice you would give to entrepreneurs specifically the drone industry. [00:34:41] LUCAS: My first piece of advice is, first look what’s already around. Secondly look at what a customer wants. Sometimes it’s just very simple right. I can be very simple things so listen to your customer. Thirdly form a good team, never under invest in your team, get the best people. This industry is moving so damn fast. You cannot settle for just student team or whatever. Students can be perfect on your team, to grow into the company but you need some really good guys on that. [00:35:21] Forth and most importantly, have a lot of fun because it’s really cool to be in this industry. Enjoy it, because you’re building something. We are just at the start of this industry, so enjoy every minute of it and enjoy building with your colleagues, with water companies, enjoy building this really cool new empire. [00:35:43] IAN: Wise advice from Lucas van Oostrum. Everybody, Lucas once again, o-founder and director of Business Development at Delft Aerial Robotics which is a city in the Netherlands. Not to be confused with the country of Amsterdam and co-founded Aeriel tronics. Thank you so much for joining us Lucas. I really appreciate you coming all the way from Amsterdam for this interview and hope you have a very safe trip back. [00:36:13] You guys can follow Lucas on Twitter @dutchcreators. You can go ahead and check out the website of Delft Aerial robotics at darfly.com and if you would please go ahead, if you like the podcast you can go ahead and subscribe on iTunes or whatever you listen to the podcast on. Leave a rating or a review, or you can go ahead and shoot us a message or join the conversation on Twitter by tweeting us or following @dronespodcast and on Facebook we are Facebook.com/dronespodcast. [00:36:45] Any last parting words Lucas? [00:36:53] LUCAS: If you have never been to San Francisco, go and get inspired. [00:36:58] IAN: Awesome. I like that advice. Hit me up if you’re here. Alrighty. Have a good one. Thanks guys. Appreciate it. Cheers.